Having carefully listened to Dr. Pidgeon's video's on CEPHER moments, taking notes then engaging within my Christian community to hold rational discussion about scripture, I have been told these things are not of the spirit of Christ and my favorite is you need to pray that these things you speak of are not demon driven???? WHAT? Really? I have known many of these people for years and now am finding out "I REALLY DID NOT KNOW THESE PEOPLE" Those that claim to be Christian, know it all and anything else is evil driven clearly have drank the Koolaid. I will not give up as the gate is narrow and few shall pass through it. Now I see what so many have been saying regarding the attacks they receive by speaking of about Yeshua. Warrior4Christ welcome to the narrow road. When you speak about scripture to Institutional Church, they look at you like you are in left field. Yet, what you are sharing with them is just right out of the book they profess to believe. When you speak of having the testimony of YAHUSHA HA'MASHIACH and the guarding of the commandments of YAHUAH or even speaking the name of YAHUAH, they go ballistic. Start asking your Christian friends about the Sabbath and what is the "Renewed Covenant" (New Covenant). Jeremiah 31:31ff and reiterated in Hebrews 8:8. YAHUAH blessings as you seek him and know the Truth. Thank You for your words of encouragement for your advice. I am feeling it is time to start a Google Hangout for the readers of the CEPHER. So that we may meet and have fellowship, speak and learn together and follow the greatest command to Love Yeshuah with all your being. In my area there are no Messianic Temple's or community's and I believe we ESPECIALLY NOW need this, time is short and to those of us that are new in the CEPHER we must have a community to check one another, discuss our reading and understanding of the CEPHER and grow together. Got the CEPHER today! It is beautiful, paper is exceptional and the print is so very easy to read! Making a big deal right? My life now is limited to essentially reading, researching at my computer. I am a disabled veteran, 12 vertebra screwed together, left humorous is a steel rod, I cannot really move around so well. I hunger for knowledge to learn, to study thus this has become my life. 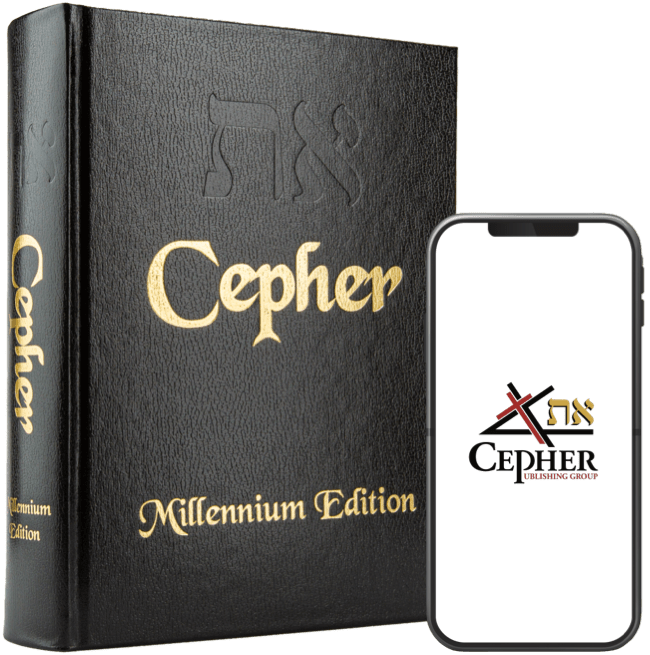 The CEPHER is more than I ever expected it to be.......(CEPHER COVER.... does not do the book justice, it is cheaply made by the Chinese, I just couldn't put this beautiful work in it so I used a really nice bible cover I own to protect it) Just my opinion. For so many of us who have not been raised to follow the traditions, feasts and Laws we are left I feel almost isolated, have you ever considered doing a "Google" Talk program ounce a week teaching us the basics up to the advanced? It could be offered at a cost or gifting from those of us who really want to know more? I personally would be MORE than happy to receive live weekly courses and further would have no problem paying for each section of teachings? I say this because in one interview Dr. Pidgeon stated some of the books included needed reader discernment as to how it was applied or used. Just an idea and wanted you to know the Book is Beautiful! Thank you all for the very hard work you did in creating this. As someone who came out of the Baptist church, I can relate with much of what you said here Warrior4Christ. What I've noticed, in speaking with family, friends and other associates, is that the response is based on fear. The strong delusion lives exactly up to its billing... it's strong and there are a lot of people that do not want to let go of the false doctrines they hold dear. I pray for them and believe more will open their eyes and see the truth... but it's like Mashiach said, "Narrow is the gate and hard is the way and there are few who find it." Truth is a very difficult "PILL" to swallow. A lifetime of lies, evil and deceit is not lightly shaken off as we are wired to hold onto "Normalcy" "Routines" and "Traditions" the problem begins when you consider that everything you knew, stood for and believed in must now be forgotten and we are to start anew. When you are 50 years old and you consider your life from Little league baseball, cubscouts to Boyscouts moving onto Military Service, Raising your children and a supreme trust in your country and Authority to be shown this was all false then try to erase these values and beliefs not because CEPHER says you must but because you know in your heart that what is being said is true WOW! This is monumental you have just discovered your whole world has been a lie and is now upside down, this is HUGE! Though very very difficult I am so thankful to have discovered Dr. Pidgeon, the CEPHER team and finally be given the whole truth, the rest is up to me. JerryB, Concerning the book collection of the Eth Cepher you could tell them that the original 1611 KJV included the apocrypha which was removed also for political reasons in the Westminster confession. The Eth Cepher now includes those books. You can also easily prove that Jude quotes the book of Enoch and that 2 Samuel 1:18 and Joshua 10:13 mention book of Jasher, proving that the authors of these two books considered the book of Jasher to be a valid source. These books are also included in the Eth Cepher. JerryB, concerning the KJV one simply has to look at the time line and the people involved in the removal of so many sacred books. You can gently guide the nay sayers asking them is the "Bible" truly the literal word of ELOHIYM? Show them REVELATION 22:18-19 then simply gently guide them to the truth. You yourself can print such information and show them but you cannot make them believe or change their hearts. Many blessings in your efforts Brother. You mentioned printing such information. Have you created any printouts and if so, is it something you can share with us who have also had similar experiences as JerryB? The best part of it all is if you ask any of those people if they have read any bible at all they look at you like your an alien. Hence the elect are a small number.